3 Card Poker is one of the newest casino games out there, which was developed by Derek Webb. The game first became available in 1994 as a quick casino game that offers ample reward opportunities. The idea was to create a faster Poker variant that still provides the great winnings of other casino games while also providing a fair house edge. Webb wanted a game that doesn’t take long to play offers easy to use rules and allows all players to enjoy the game of Poker a lot faster. As you can imagine, many rules from the regular Poker game had to be changed as only 3 cards are used per round. However, many of the regular rules are still in use, which is one of the things that makes the game exciting and fun to play. This also includes the rankings and the betting system involved with 3 Card Poker as players can still choose to play (raise) or fold. There are none of the technical features involved with a regular hand of Poker such as Hold’em as the table also includes the full payout system and the few rules needed to be known by the player. This means for those of you who have a sound knowledge of casino games and Poker, should be able to play the game by simply reading the rules on the table. However, having an additional edge is one of the keys to any casino game, which is why you need to know what the different options are and when you will win. As with all other casino games, 3 Card Poker also comes with an edge. However, this is a minuscule percentage, making the game fair and enjoyable as with most other table games. Players can enjoy this Poker variant in some land-based casinos, but for the best opportunity, online casinos are sure to impress more. In this article, we look at all the features of 3 Card Poker, what the game has to offer in winnings, the rules, how to play the game, and also a few strategies. 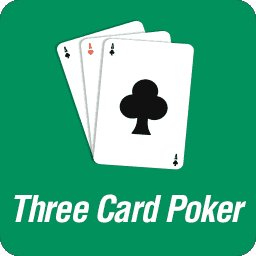 3 Card Poker is played with 3 cards for the dealer and 3 cards for the player. The dealer cards will remain face-down until you’ve selected Play or Fold. However, to start the game, you need to place a bet on Ante. You will also see an additional bet option called Pair Plus, which includes other winnings when you have certain combinations. As for the standard game, once you’ve placed the ante bet, the game will provide the cards. You need to see if any of your cards match have the same suit, or same value, which would be considered a combination. Most hands with a King or Ace high card are seen as rather powerful, and they would win in most hands. Should you have a pair or any other combination, press play, which places a bet equal to your ante bet in the Play box. The dealer will then flip over his cards, and your hands will be compared. Should both your hands only have a high card, the winner would be the one with the highest value. However, if you both have a pair, it will once again depend on the value of the cards involved. On the table, all the rules are explained as mentioned. Here you will find the dealer only plays with a Queen high or better, which results in the Play bet being pushed (no one wins) and the ante bet provides a payout of 1:1. If you manage to beat the dealer with a high card when the dealer qualifies, you will receive a 1:1 payout for play and ante. The payouts in the game most consist of 1:1, which would be a winning for anything less than a straight. The regular ante bet will offer bonus payouts for anything above, which includes three of a kind and a straight flush. For additional winning, players would need to use the pair plus bet that will provide more winnings for your game when you have anything from a pair and up. The regular bet, being the ante bet will give you a 1:1 payout for a straight and anything below. If you get 3 of a kind, the game will boost your payout to 4:1, which requires 3 of the same card values in any suits. The straight flush will offer 5:1 on the ante bet, which will require all 3 cards to have the same suit and they need to be in a consecutive order such as 5, 6, 7. While these winnings might seem impressive, you will find the Pair Plus side bet has a lot more to offer. Since this is a side bet, you will receive your payout for anything combination you might have even if the dealer beats your hand. For example, if you have a pair of 2’s and the dealer beats you with a pair of 4’s, you will still win 1:1 on the Pair Plus bet. This makes it very attractive as players can still earn winnings on good hands. The Pair Plus also offers much bigger winnings and covers more hands. This all begins with a pair of any kind, which gives even money as mentioned. The next winning will be granted for a flush, which requires all 3 of your own cards to have the same suit, which pays 4:1. This is followed by a straight that consists of any suits but cards need to follow in value for a reward of 6:1. Three of a kind is the same as that explained in the ante bet winning, but in Pair Plus you will receive 30:1. Finally, a straight flush combination is the highest in the game, which gives you a huge win of 40:1. Players can also choose any bet amount for the Pair Plus bet, which means you can wager a minimum bet on ante and use a much higher bet on Pair Plus or the other way around, which gives you more opportunities and strategies to benefit from. There are a few things you would need to keep in mind while playing 3 Card Poker. This includes knowing when to fold and when to play. This can be quite challenging as you would have no idea what cards the dealer has. However, if you keep to your own set of rules, you will find managing your winnings is fairly easy. Firstly, with any hand that doesn’t have a combination such as a pair or better, you would only play high cards of a Q, K, or A. Any cards lower than this should not be played, meaning you fold. This is because the dealer needs at least a Q to qualify, and of you have a Q or better, it will result in a push, or you would win if you have a higher card. With high card hands, only the highest card used to win, meaning if you have an J, K, A, only the Ace would be used against the dealer. Any hand above the dealers would result in a win unless the dealer has a better combination. However, as mentioned, if you play Pair Plus and have a combination, you will still receive a payout even if the dealer’s hand results in a win. Professionals also choose to use a higher bet on the Pair Plus bet as this will cover your losses or provide a much bigger win when you have a good hand. Those of you who prefer to play it safe should use the minimum bet on both Ante and Pair Plus, which would still include the additional winnings for pairs. Also, keep in mind that a higher bet on the ante means the wager amount would be higher as well as this is matched to your ante bet. There are only a few betting strategies that can be used with 3 Card Poker. Many players think the progressive system such as the Martingale system would work, but the fact is this will require way too much math and trying to keep up with when you lost just an ante bet or when you’ve lost an ante and play bet. Not to mention, your bet values would increase drastically when you lose on both ante and play. The game of 3 Card Poker is rather complicated when it comes to applying bet systems since you need to consider all the bets placed, including ante, play, and the pair plus bet. However, there is one way of playing a progressive game with 3 Card Poker, but this is very risky and most of the time you would reach the table limits before winning a hand. The only way to play progressive is to use the play option on every hand. This means you never fold. Your bet on ante would be 1 unit, meaning your play bet would be the same. Should you lose a hand, your next ante bet would need to be 2 units, which adds up to 4 units for the round as play would also be included. If you win the second round, you will receive 8 units (2 from the ante bet and at least 2 from the play bet). This means you would cover the 6 units wagered, and make a profit of 2 units. However, should you lose multiple hands in a row, your bet would increase by a huge amount as you need to double up on 2 units each time. For example, 6 losing hands would increase the bet as follows; 2, 4, 8, 16, 32, 64, which means a total of 126 units would have been wagered. Should you win the bet with 64 units, it would mean there is a bet of 32 units on the ante and 32 units on the play. The ante bet would return a total of 64 and so would the play bet, meaning a total win of 128 units. This would mean you’ve covered your losses and made a 2 unit profit. This might be attractive for some players, but be sure to keep track of all your hands and always consider the play bet when progressing is this way as a single miss calculation would result in a loss, which also progresses as you go. Some hands you would win out of pure luck as the dealer might not qualify, but then again only the ante bet would pay. This could be used as a midway reward, meaning your next bet in the new progressive amount, or you could decrease your next bet by the amount you’ve won until you manage to full win on both ante and play. The only other option with the game is to use something like the number cancellation system, which provides the ability to use lower bet amounts without having it reach huge values. However, this could result in a long game as 3 Card Poker is famous for the fact that it can go some hands without providing a win. A cancellation system such as Labouchere uses a row of figures that are canceled out with a winning hand, but carried over with a losing hand and wagered again. For example, you would have a row a five 1’s (11111). Add the first and last numbers together, which tells you to bet 2 units. If you lose, write a 2 at the end of the row and do not cancel out any numbers. This means the next bet would be 3 units. Only win a combination of numbers win will you cross them off. So, if you lose the second hand as well, you would add a 3 after the 2 at the end of you row and once again use the first and last number. This is also a progressive system, which has been combined with a cancellation system. One very important thing to keep in mind with a cancellation system is once again the play bet. If you wagered 2 units in the last game and pressed fold instead of play, you would add 2 to the end of your list in case of a loss, but if you lose after pressing play, you would need to add 4 to the end of your row instead of 2 as the play also needs to be covered.